One way customers find to save money on long distance moves is to rent your own truck and hire professional movers to load it. The truck rental company will try and get you any way they can so being informed and prepared will save you big time here. Truck rental companies will offer pads, dollies, boxes, shrink-wrap, tape, four-wheel dollies, appliance dollies, gps…. the list goes on and on and really adds up for point of sale purchases. Keep in mind when calling your movers to get rates most of them will bring there own dollies, and tools to do the job. No need to rent them, the ones the movers have are stronger and better suited for the job so just ask the movers when getting prices if they will be bringing their own equipment. If you need to purchase boxes a truck rental place is the most expensive place to buy them! Large retail chains are the second most expensive place to buy them! 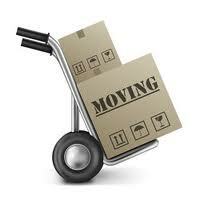 Call some local movers, most of their suppliers sell to the public as well! Keep in mind that moving long distance requires the truck to be packed very well so that your items don’t shift while driving, this means getting the same size boxes so that they will stack well. For this reason it is not a good idea to use totes, bags or free grocery store boxes. They just won’t create a good stack and the money you’ve saved in boxes will cost you a lot more if your furniture falls during the drive and breaks. Local box suppliers that deal strictly in moving supplies sell boxes sooooo much cheaper than retail chains or truck rental places. Keep in mind that while the movers will bring the dollies you will be required to supply pads or blankets to protect your furniture. Here is where you will want to spend some money at the truck rental place. One dozen pads usually rent for around $12.00, they are thinner than commercial moving blanket so get about twice as much as you need. For a three bedroom home you need about 5-6 dozen. 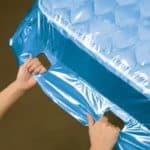 The movers will likely use more than one pad per piece for added protection. The $12 you spend on renting a dozen pads will save you money by protecting your furniture from damage. Blankets and comforters will work too, which saves you having to pack them! All rental trucks are not the same. Check the height of the box on the truck. Some rental trucks have very short boxes compared to others. This makes a huge difference on how much furniture the truck will hold. Often times the price for the truck is based on its length 15ft, 20ft, 26ft, etc but different height box trucks are the same price so definitely worth looking into. Purchase rope. The movers need the rope to tie off the load at the end of a tier (row of furniture/boxes) if rope is available they will use it. This creates a much more stable load. Once again buy your rope where you get your boxes, or big chain supply stores are okay to buy rope it’s not marked up too much there. Thin white rope works just fine. Do you have any money saving tips you want to share? We’d love to hear from you!